Plugin for using various 433 Mhz devices and sensors with a connected Arduino with homeduino sketch or directly with capable hardware like the Raspberry Pi. It is based on the homeduinojs driver implementation. This plugins supports all 433 MHz devices with rfcontroljs protocol implementations. The pin numbers are Arduino pin numbers. The receiverPin must be either 0 (INT0) or 1 (INT1). The transmitterPin must be a digital pin between 2 (D2) and 13 (D13). The pin numbers are wiringPi pin numbers. A list with all supported protocols and protocol-options can be found here. RF Actors like the "HomeduinoRFSwitch" can be controlled or send to outlets with multiple protocols. Just add more protocols to the protocols array. You can also set if a protocol is used for sending or receiving. Default is true for both. In some cases the target receiver does not recognize the transmission. To improve this you can change the amount of message repeats. By default this is set to seven. A "HomeduinoRFSwitch" can only use switch protocols. A "HomeduinoRFButtonsDevice" can use switch and command protocols. The "HomeduinoRFDimmer" can only use dimmer protocols. The equivalent to dimmer1 is the switch1 protocol. RF Sensors receiving data from any kind of external sensor over 433Mhz messages. It supports different values to display rain, temperature, humidity, windGust, windDirection, avgAirspeed, lowBattery and battery. The ordering corresponds to the display ordering in the frontend. lowBattery is an boolean value and battery is an percentage value from 0 to 100. Most protocols supports only an lowBattery value. An AnalogSensor can read analog pins of the Arduino and display there value. An optional preprocessing can be applied. Pin numbering starts at 14 (A0) for the first analog pin. "processing": "($value / 1023) * 5"
The analog value is between 0 and 1023 and can be preprocessed by an expression. In this example the value is scale to a value between 0 and 5. An ContactSensor can read digital pins of the Arduino and display the state of it. The pin must be set. Interval and inverted are optional. They are set by default to interval = 10000 and inverted = false. 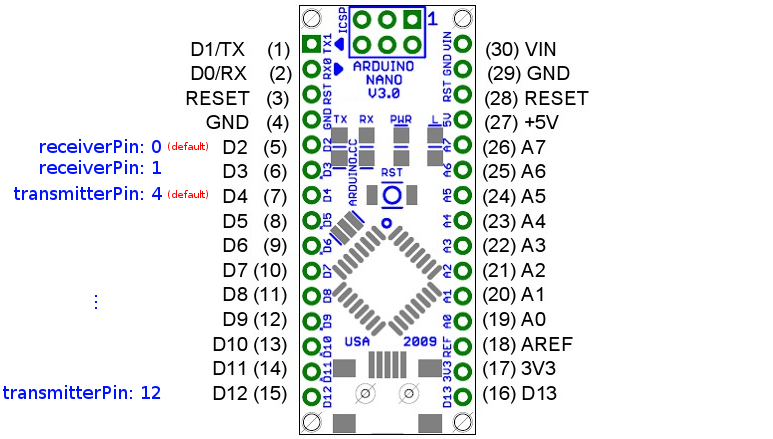 A PIR sensor can read digital pins of the Arduino and display the presence state of it. A local actor is an output on the Arduino like an digital pin or a PWM. 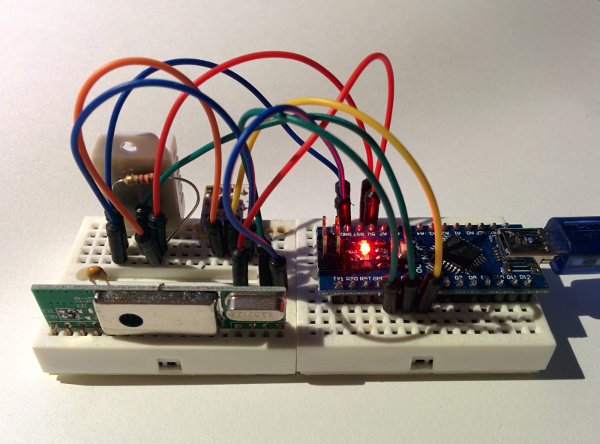 The "HomeduinoSwitch" can toggle the state of an pin on the arduino. The AnalogDimmer activates one of the PWM channels on the Arduino. At the moment only the following pins are allowed 3,5,6,9,10,11. The Dimmer maps an value from 0-100 to 0-255. The PWM frequency is about 490Hz.